This week, our glass guide Scott “Trikky” Saed, professes his love for the simplicity and beauty of marbles. When most people think of marbles, it brings up memories of childhood, shooting marbles in a circle. Typically these marbles were low-cost, mass produced, and generally meant to be beaten up, broken, and thrown away when used and abused. 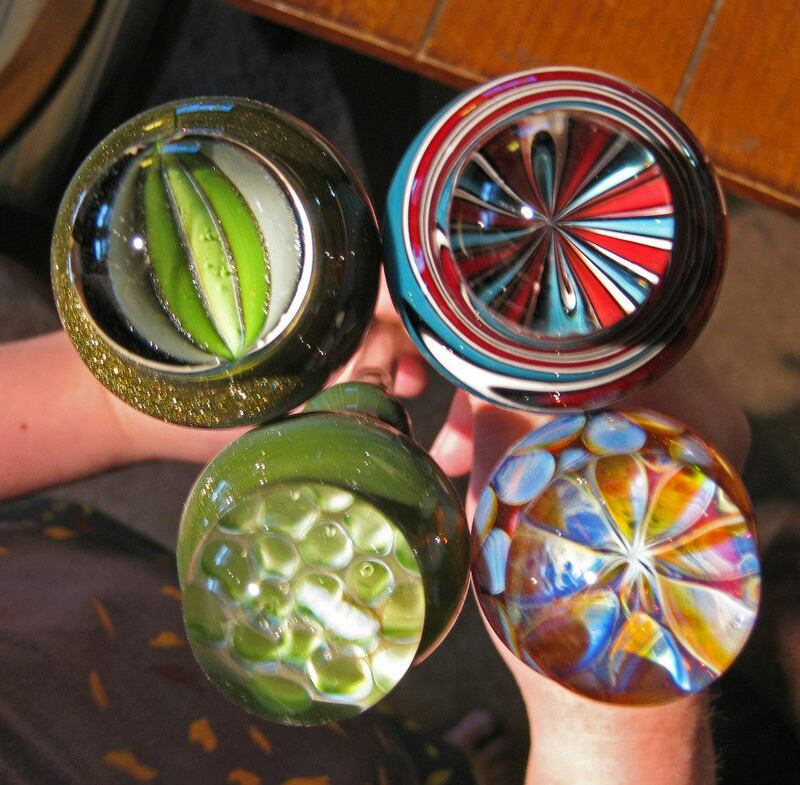 Generally, mass-manufactured marbles aren’t very highly prized by glass collectors in today’s world. 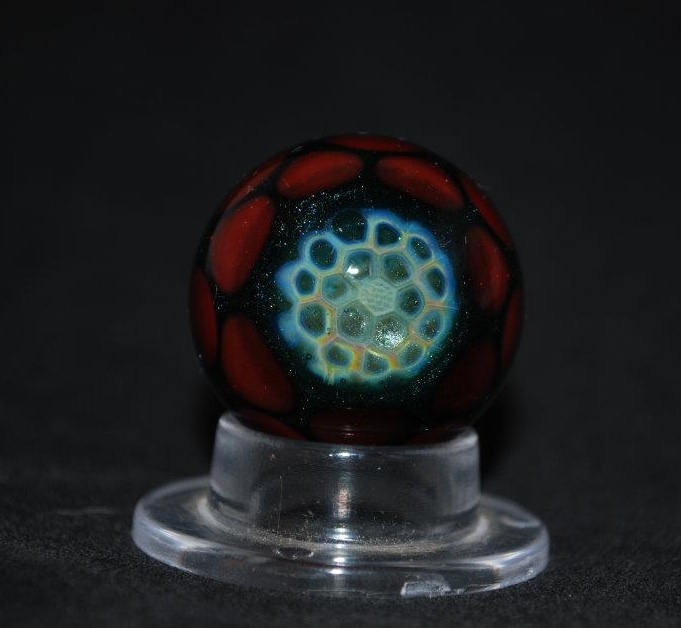 But from the concept, emerged some of the most intricate, delicate, and expensive forms of glass art: the MIB, or Marble in Boro. 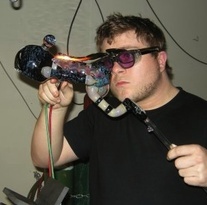 Boro is short hand for borosilicate glass, the type of glass used in laboratories, in high-end glass pipes, and (in this case) marbles. The most basic element of a marble is the most obvious: it is round. This is typically achieved with some sort of hemispherical mold of graphite or moistened wood. This differs them from paperweights, which are designed with an intentional flat spot, so the glass supports itself on it’s own base. Marbles are typically displayed on a small, round piece of plastic tubing, or on a hand made marble stand of different sorts. 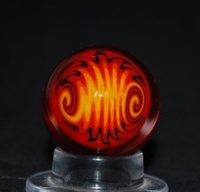 Black hole marble by Trikky. Often the goal of the marble maker is to make a small, spherical representation of their work in an intricate way. As such, it is best to view them up close, as to admire the detail work. The variety of patterns and concepts that can be represented in a MIB, are endless. You might have a marble with only color work on its surface, and nothing within the mass of the glass itself to see from the outside. 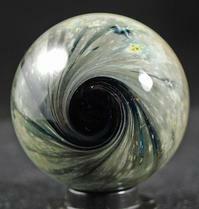 Most commonly, you’ll have a marble divided into two parts within one marble: the lens and the backing. Wig-wag distorted by the curved lens by Trikky. The lens can often contains a pattern that looks exceptional when magnified by a large, curved lens of clear glass on top of it. 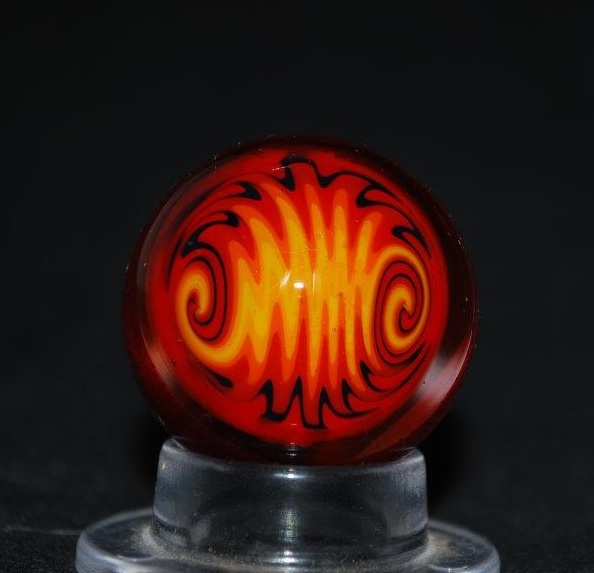 Some quick examples of what you might find inside the lens side of a marble are wig-wags, vortexes, and dichroic glass. The backing is typically surfaced worked in some way to create a backdrop for the design. Oftentimes, artists use a series of dots of colored glass melted atop one another to achieve a beautiful backing appropriately called dot-stacking. Just as with the lens, the backing of a marble can literally be an endless number of patterns and colors, limited only by the imagination and skill of the artist. The way I see it, the marble is the perfect vessel for an artist to show off his or her ability to create an intricate piece of art that both represents himself or herself as an artist, but also must fit the confines of what a marble truly is by definition.